The Salaff String Quartet represents SCMR at The Children’s School of Rochester (CSR), #15 for a concert and masterclass. 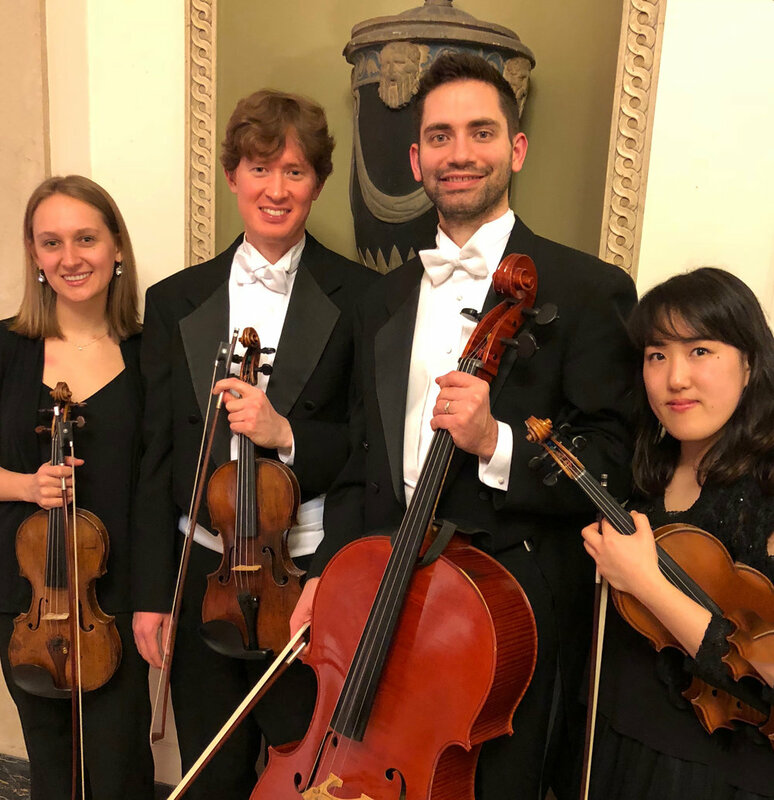 The Salaff String Quartet was founded in 2014 by four members of the Rochester Philharmonic Orchestra, Thomas Rodgers (violin), Molly Werts McDonald (violin), Aika Ito (viola), and Benjamin Krug (cello). They all attended the Cleveland Institute of Music at different times but all studied chamber music with the same beloved teacher, Peter Salaff, for whom the quartet is named. As friends and young members in the orchestra, they enjoy performing together throughout the Rochester area. They specialize in classical music but are also pleased to present a wide variety of music for events such as weddings, corporate events, receptions, and parties. The quartet also has a passion for outreach performances in the community. Thomas Rodgers, violin, a native of Anderson, Indiana, joined the RPO in March 2012 as a member of the first violin section. In the 2014-2015 season, he served as principal second violin. Molly Werts McDonald, violin, a native of Fairway, Kansas, joined the RPO in October 2013 as Acting Assistant Principal Second Violin. She has been playing in the first violin section since September 2014. Aika Ito, viola, a native of Tokyo, Japan, joined the first violin section of the RPO in September 2014. Benjamin Krug, cello, a native of Royal Oak, Michigan, joined the RPO in September 2008. "The Arts are essential to the development of our students; therefore, our mission is to educate students by engaging and inspiring them to be life-long learners through active participation, creative expression and cultural awareness in the arts. We facilitate learning and understanding by using an integrated, sequenced, interdisciplinary, and standards-based curriculum." 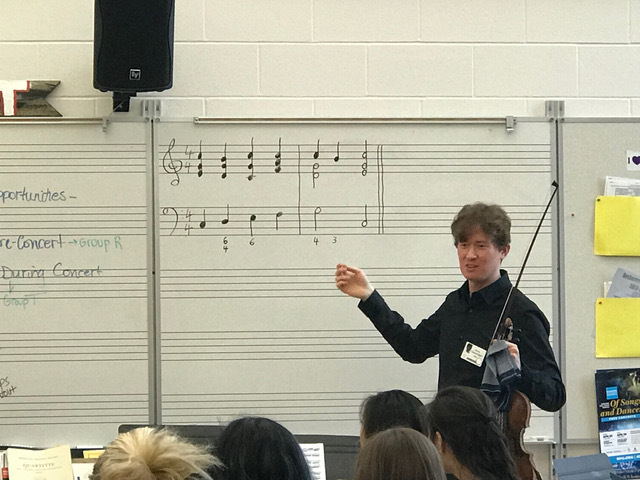 Representing SCMR, the Salaff Quartet presented Baroque and Blues music to two sections of Shana Stewart's orchestra classes at Penfield High School on Tuesday, April 24, 2018. Thomas Rogers, Molly Werts-McDonald, Aika Ito and Benjamin Krug played excerpts from J.S. Bach’s double violin concerto as well as a swung version of the same, Pachelbel’s Canon and a Duke Ellington tune for string quartet. They also had the opportunity to listen to and coach three student chamber ensembles and one solo violinist. © 2018 Society for Chamber Music in Rochester All rights reserved.